Time has left the trail of the past and arrives at the doorstep of 2013. During this year fortune will smile on Florida as she celebrates a very special birthday marking 500 years of Spanish presence and influence that has shaped the heritage of our state. For it was in 1513 that Ponce de Leon and his small fleet of ships landed off the Atlantic Coast to mark the beginning of the longest recorded history ever of any American state. Columbus may have discovered the Americas in 1492, but European influence in Florida far predates the establishment of Jamestown, Virginia in 1602 and the arrival of the Pilgrims at Plymouth Rock in 1620. La Florida, “land of flowers” how fitting a name Ponce de Leon christened our state, dazzled by the vibrant blooming colors he saw set intensely against the glittering waters of the coast. Further inland the varied landscape would reveal rich hardwood hammocks, open savannahs of grasslands and crystal waters of deep blue springs and pristine lakes. The ancient flow of the many rivers would expose paths cut through deep terrain creating water trails used by native people here long before the famed terra firma landing of 1513. Contrary to legend, Ponce de Leon was searching not for the fountain of youth, but for gold. What he discovered was a bounty of natural treasures which exist still as a valuable legacy to cherish and appreciate. Some of these abundant treasures have been captured on a diversified series of trails created and maintained throughout the state and accessible for simple enrichment and pleasure. These varied trails abound across our area of northern Florida. There are gateways and well established trails that challenge and satisfy seasoned and novice hikers. There are bicycle trails with additional paths in the planning stages or under construction that will open new vistas to cyclists. There are paddling trails accessible to canoeists and kayakers that circumnavigate the coast or explore meandering rivers and hidden creeks. There are walking trails that amble through green spaces and nature trails that lead to discovery and chance encounters with wildlife. Then there are the history and heritage trails that preserve memories and connect us to our collective past. One such cultural trail is the intriguing Florida Spanish Colonial Heritage Trail. As a showcase of Viva Florida 500, the multifaceted commemoration sponsored by the Florida Department of State and its many partners, this trail will provide its visitors enriching events and experiences highlighting more than 50 Spanish heritage and historical sites – museums, forts, parks, shipwrecks, memorials and churches - as it traverses the state. Although the Viva Florida 500 initiative honors a quincentennial of rich history and the many diverse cultures that make up the face of Florida today, our region in particular played a significant role in the early Spanish expansion through Florida. The heritage trail naturally charts straight across our area as it links together the older garrison cities of St. Augustine and Pensacola. It was Conquistador Pánfilo de Narváez who in 1528 led the first overland expedition of 300 men marching from the Tampa Bay into the province of the native Apalachee looking for the promise of gold and fame. What he found instead were the riches of corn, wheat, and other indigenous crops expertly farmed by the highly organized agrarian society of the Apalachee. Their expansive territory was defined by the Aucilla River to the east extending to the Ochlockonee River on the west. 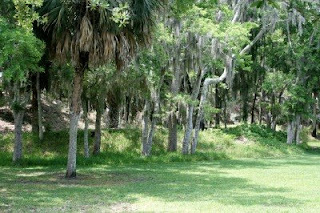 Narváez and his men remained for a time in the area nearby the confluence of the St. Marks and Wakulla rivers which today marks the National Landmark site of Fort San Marcos de Apalache. From Apalachee Bay out past the present day St. Marks Lighthouse, the expedition made their eventual departure on five crudely constructed rafts setting sail into the gulf. A few years later in 1539 Explorer Hernando DeSoto on another quest for gold led a similar overland expedition from Tampa Bay of several hundred people, not only a cavalry and infantry, but craftsmen, servants and friars, as well as horses, dogs, pigs, weapons and tools. DeSoto marched his contingent into the Apalachee province and made temporary winter camp the first year. The very first Christmas in the Americas was celebrated here in the shadow of the modern state Capitol in Tallahassee. This is the only site of the DeSoto expedition that traveled across the southeastern United States to be confirmed through specific evidence unearthed by archaeologists. The DeSoto Winter Encampment Site is now a historic state park with a building that houses artifacts open to the public Monday-Friday, 9-5, but the 6 acre park with markers and displays is accessible at all times. Traveling a few miles west from the DeSoto site, visitors will encounter Mission San Luis, a large community that existed for three generations where over 1400 Apalachee Indians and Spanish colonists lived together in the western capitol of the Spanish mission system in Florida. Mission San Luis precedes the California missions by 150 years and is the only reconstructed Spanish Mission in Florida. The fort, church, and large council house have been recreated with painstaking accuracy. Guests can experience a sense of daily life through exhibits and living history demonstrations as time stands still at this must-see site along the heritage trail. Open Tuesday-Sunday, 10-4. Check www.missionsanluis.org for a schedule and calendar of events. Southward we travel back to the site of Fort San Marcos originally built in 1679 to protect the inland Spanish missions. The first fort was built of logs whitewashed to look like stone. The actual stone foundation of a later fort, the remainder of a wall, bastion, and evidence of Confederate earthworks and powder magazine can all be easily seen. A small museum displays pottery, tools and other artifacts taken from the surrounding area, interpretive displays and a brief video that recounts the days of the Spanish, English, American and Confederate forces that once occupied this site. In mid-April, a special combination historical walking and boat tour, “Conquistadors in the Fabled Land of the Apalachee” will be offered to visitors during the 2013 Wild About Wakulla Week to celebrate Viva Florida 500. Check palmettoexpeditions.com or wildaboutwakulla.com for details. The state park museum and grounds are open Thursday-Monday, 9-5. I walk softly in my comfortable leather moccasins over the damp lichen lined ground. Quietly I move down the well-worn path underneath a moss draped canopy that soon opens into a clearing. It is here the first fort existed, strategically overlooking Apalachee Bay. I carefully make my way past the small pools of collected rainwater and step into the natural grotto of sturdy sabal palm and feathery cypress that guards the limestone outcrop. Here precisely the two rivers converge – the St. Marks and the Wakulla. This is the exact spot where Pánfilo de Narváez once stood looking out into the bay just as I do now. Each and every time I stand here I feel goose bumps and my heart skips a beat. “Magical” is how I have always described this place even before I knew the history that I now understand. Because the spirit of Narváez lives here - connecting me to the collective breath of all who been here before me - to all those yet to come. If the first Christmas celebration took place near here, then so did celebrations of the first New Year. Along with all the hopes and aspirations for the best yet to come, we journey like those before us through the coming year and leave our mark. Leave your mark along the Florida Spanish Colonial Heritage Trail during this quincentennial year of Viva Florida 500. For detailed information, visit www.vivaflorida.org.